Over the past two years, the Moroccan Government has reversed a trend of liberalization in regard to media that began with King Mohammed VI’s ascension to the throne in 1999. Along with the threat of imprisonment, more common forms of pressure are confiscation of publications or heavy fines levied on publishers. On 15 November 2009, a publisher and a columnist for widely read independent daily Al Massae were convicted of “spreading false information” after they published an article discussing the drug trade in Morocco. They were sentenced to three and two months in prison, respectively (MAP, 16 November 2009). The Moroccan Ministry of the Interior on 27 September 2009 shut down the independent daily Akhbar al Yawm and imprisoned its editor and cartoonist after the daily published a cartoon depicting the King’s cousin in front of what appears to be an incomplete star of David on the Moroccan flag. The two men were charged with disrespecting the national flag and failing to show respect to the prince, resulting in four years of suspended jail sentences and over $400,000 of fines each (TelQuel, 3 October). As increasing portions of Moroccan society begin to gather news on the Internet, the regime will be faced with a decision regarding the extent and purpose of its control over the Internet. Rabat will likely choose to keep the status quo, rather than cracking down on Internet use, in effect liberalizing the online community over time as more citizens gain Internet access and limited government resources mean only the most egregious offenders can be prosecuted. 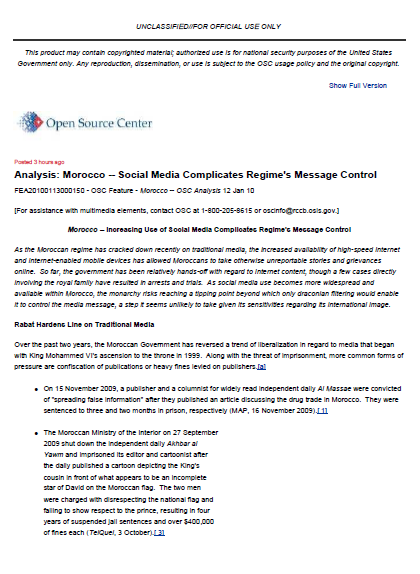 Given the value that Morocco evidently places on projecting the image of a modern, liberal state, as well as the technical difficulties that would be inherent in an effort to surveil or crack down heavily on the large number of bloggers and Internet users who cross traditional red lines, Morocco is unlikely in the long term to engage in draconian filtering or surveillance regimes. While the regime will almost certainly continue to harass and make examples of those it thinks have gone too far, doing so will engender further opposition from within and greater international pressure to avoid such actions as imprisoned bloggers and journalists become causes celebres.